Foreword (S. Zeki). Introduction (W.H. Zangemeister, H.S. Stiehl, C. Freksa). From Early Scanpath Theory to Application to Robot Vision. Experimental metaphysics: The scanpath as an epistemological mechanism (L.W. Stark, Y.S. Choi). Neuropsychological Aspects. Synopsis. 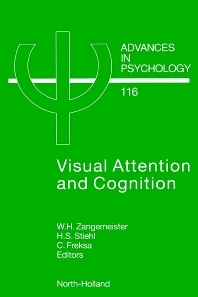 Neuropsychological aspects of visual attention and eye movements (G.W. Humphreys). Search and selection in human vision: Psychological evidence and computational implications (G.W. Humphreys, I. Gilchrist, L. Free). Visual attention and saccadic eye movements in normal human subjects and in patients with unilateral neglect (J.M. Findlay, R. Walker). New developments in the understanding of the hemispatial neglect syndrome (H. Haeske-Dewick, A.G.M. Canavan, V. Hoemberg). Attention and communication: Eye-movement based research paradigms (B. Velichkovsky, M. Pomplun, J. Rieser). Clinical Neuroscience Aspects. Synopsis. Clinical neuroscience aspects of visual attention and cognition (W.H. Zangemeister). The role of attention in human oculomotor control (M. Husain, C. Kennard). Imaging of visual attention with positron emission tomography (R.J. Seitz). Evidence for scanpaths in hemianopic patients shown through string editing methods (W.H. Zangemeister, U. Oechsner). Modeling Aspects. Synopsis. Visual perception and cognition: A synopsis of modeling aspects (H.S. Stiehl). The collicular motor map as modelled by a two-dimensional mapped neural field (A. Schierwagen). Optomotor processing in the prey catching of amphibia (H. Schwegler). Designing an active vision system (K. Pahlavan). Saccadic camera control for scene recognition on an autonomous vehicle (H. Janßen). From active perception to active cooperation - fundamental processes of intelligent behaviour (R. Bajcsy). Application Aspects. Synopsis. Visuo-manual process control (A.H. Clarke). Adaptive control of teleoperators in response to visuo-manual relationship alteration (G.M. Gauthier, O. Guedon, R. Purtulis, J. Vercher). Current trends in eye movement measurement techniques (A.H. Clarke). Selective visual attention during multiple-process control (A.G. Fleischer, G. Becker). Closing Comment (V. Braitenberg). Contributors. Index. The goal of this book is to put together some of the main interdisciplinary aspects that play a role in visual attention and cognition. The book is aimed at researchers and students with interdisciplinary interest. In the first chapter a general discussion of the influential scanpath theory and its implications for human and robot vision is presented. Subsequently, four characteristic aspects of the general theme are dealt with in topical chapters, each of which presents some of the different viewpoints of the various disciplines involved. They cover neuropsychology, clinical neuroscience, modeling, and applications. Each of the chapters opens with a synopsis tying together the individual contributions.